This validator checks whether user input matches the given (perl-like) regular expression. It checks the complete input; prefix ^ and suffix $ are not needed. No Lookbehind support, i.e. the constructs (?<=text) and (?<!text). No atomic grouping, i.e. the construct (?>group). No conditional expressions, i.e. the consturct (?ifthen|else). This validator does not fully support unicode: it matches on the UTF8-encoded representation of the string. 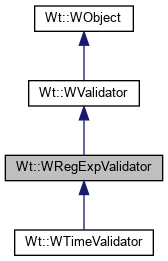 This constructs a validator that matches the perl regular expression expr. Returns the perl regular expression. Sets the text to be shown if no match can be found. Sets the perl regular expression expr.